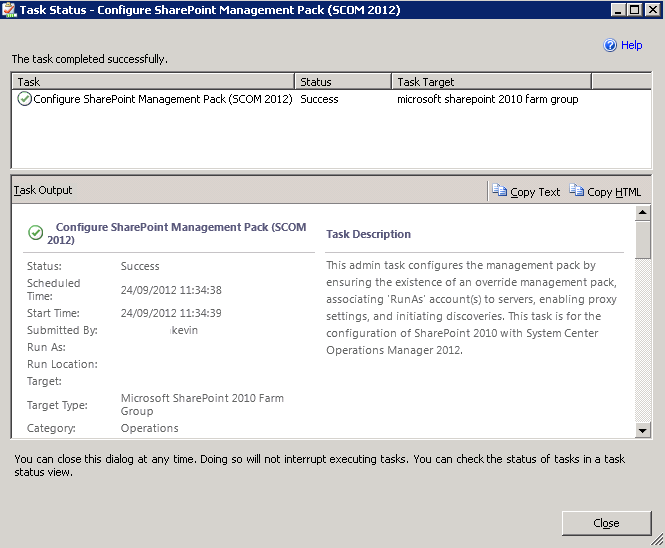 In the last week Microsoft has released the latest updated OpsMgr/SCOM 2012 management pack for monitoring SharePoint 2010. Prior to this release, if you wanted to monitor and manage your SharePoint farms with SCOM 2012 using a Microsoft produced management pack, you had to either be a Microsoft employee, on a System Center Technology Adoption Program (TAP) or have participated in the SCOM 2012 Community Evaluation Program (CEP). 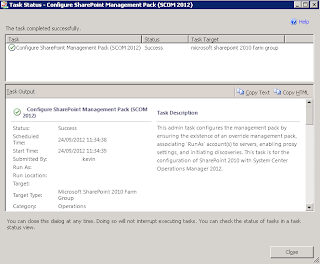 Thankfully I had participated in the SCOM 2012 CEP back last October and had access to a pre-release version of this management pack that basically added an additional Admin task to the SCOM 2012 console that supported the discovery and monitoring of your SharePoint 2010 farms. As the pre-release version of the management pack I had wasn't officially supported by Microsoft, to say I was waiting patiently for this fully supported one to be released is an understatement! This blog post will walk you through the steps required to get this MP up and running. Follow the instructions in the guide for the Microsoft SharePoint 2010 Management Pack for SCOM 2007 to install and import it into your environment. Make sure you have configured your Run As accounts as per the guide recommendations as they will be required later in this process. 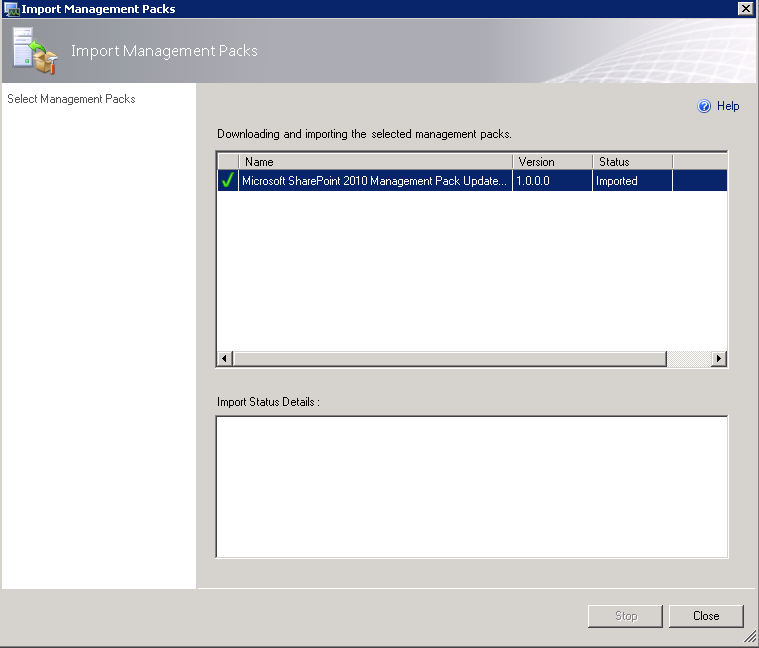 Once you have the Microsoft SharePoint 2010 Management Pack for SCOM 2007 imported, you can now go about installing the updated management pack for SCOM 2012. Now, this is where things can start to go wrong with this management pack if you're not careful. 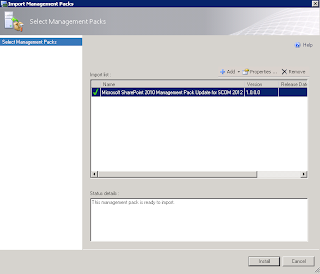 Once you have copied the management pack file from the (x86) folder to the new location, in the SCOM 2012 console, browse to the Administration tab from the Wunderbar, expand the Administration view, right-click on Management Packs and then choose the Import Management Packs option to start the wizard. 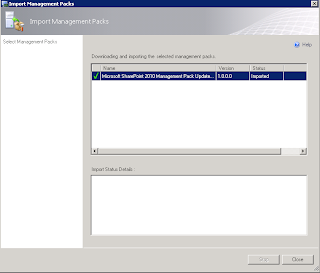 In the Import Management Packs wizard, choose the Add from Disk option and then browse to the new location that you copied the 'Microsoft.SharePoint.2010.SCOM2012.mp' file to. 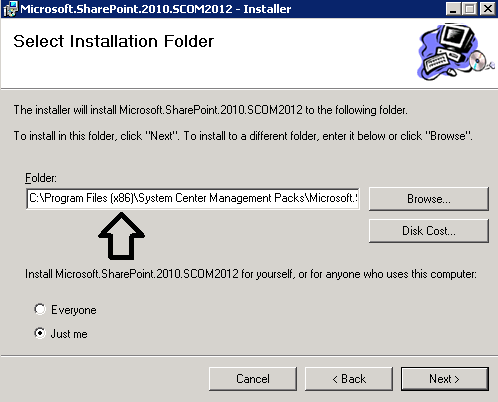 If you've followed the instructions above, this location will be 'C:\Program Files\System Center Management Packs'. Double click on the coped management pack file and you will then see something similar to the screenshot below. 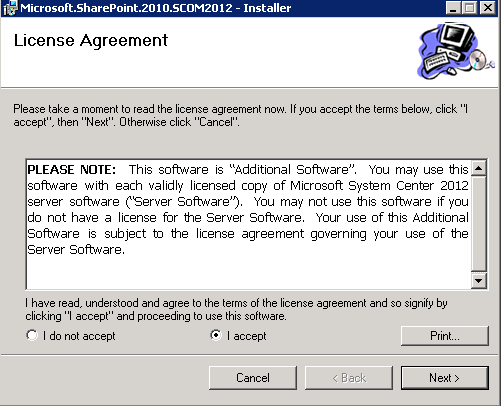 Note: If you haven't met the prerequisites and first installed the Microsoft SharePoint 2010 Management Pack for SCOM 2007, you will receive an error here stating that there is a dependency missing. When you click on the Install button, you should then see confirmation that the new management pack has been imported successfully. Click the Close button to exit the dialog box. 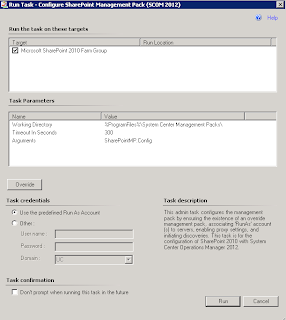 It's this value that had the requirement for us to earlier copy the management pack file out of the (x86) directory and move it as without the file being copied, this task wouldn't run. 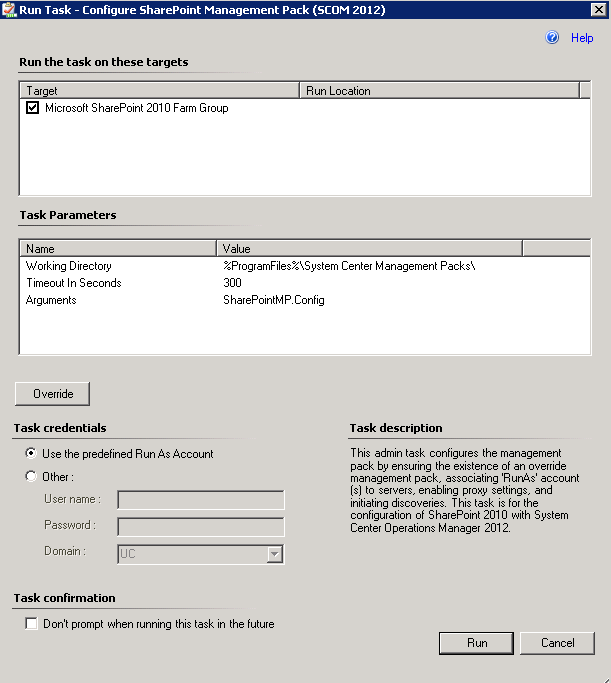 If you have correctly configured your Run As account for the Microsoft SharePoint 2010 Management Pack for SCOM 2007 as per the guide recommendations, then you should be able to just click on the Run button inside this task. 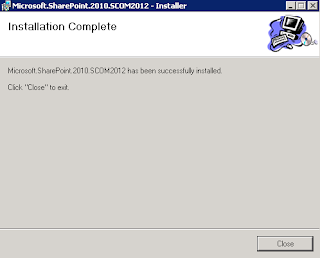 You will then be presented with the following screen confirming that the discovery of your SharePoint 2010 Farm Group has been successful. Note: Make sure to wait a while for the discovery process to complete in your environment as it won't always show up in the console immediately. That's all that you should need to do to get up and running with your SharePoint 2010 monitoring using SCOM 2012. 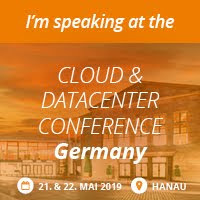 After a few weeks off on holiday/vacation, the batteries are fully recharged and I'm ready to hit the ground running - starting out with a lot of upcoming System Center 2012 projects to get stuck into. I'm also counting down the days now until our new 'Mastering System Center 2012 - Operations Manager' book hits the shelves towards the end of next month. A consequence of being away on holidays for a few weeks means that when you come back, there's always an abundance of unread e-mails and Twitter feeds to catch up on. This blog post is about one such piece of information that caught my eye and deserved a mention. "The System Center 2012 Integration Guide provides an overview of each System Center component in its role as a programmable platform to be leveraged for the Microsoft Private Cloud. It is intended to provide an abstraction layer that guides partners and customers on their decision process for methods to build automated solutions across System Center components." 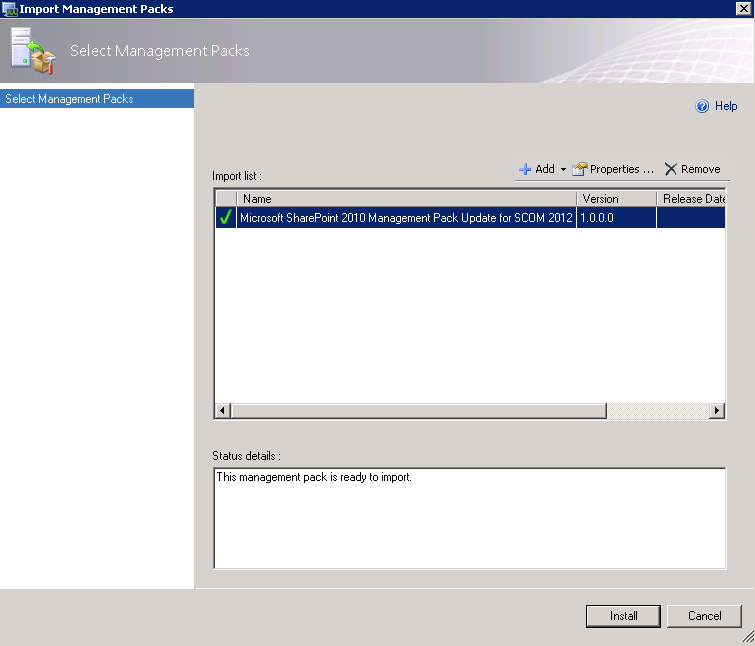 There will be a separate section in the guide for each of the major System Center 2012 components and although the DPM integration guide hasn't been added yet, it has been labelled as 'coming soon' and we shouldn't have to wait too long hopefully! Each of the individual product integration guides have been broken down into sections such as a product overview, their role in the microsoft private cloud, programmability, product specific Integration features/packs/points and then finally a System Center integration section. Also, as this guide has been published on the TechNet Wiki, it means that System Center community members can add their own revisions and edit's to it (within reason and subject to moderation of course!) as they come across new and useful information - making it an overall excellent central resource when working with the integration of each of the System Center products.